Marmaris is a port city and a tourist resort on the Mediterranean coast, located in southwest Turkey, in MuÄla Province. Marmaris is a heavenly corner where you can see all grades and harmonies of green and blue during the twelve months of the year. 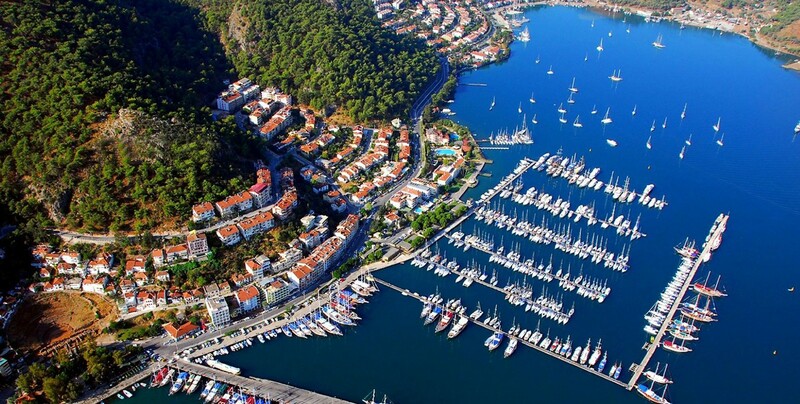 The abundance of bays in the long coast line; its being a natural port; ancient cities; natural attractions; Blue Cruise facilities, marina for 800 boat and water-sports facilities are the peculiarities making Marmaris a paradise for tourists. Since it has the Mediterranean climate, it is possible to enjoy swimming in the sea even in winter. Thick and high pine forests surrounding it, large leafed plane trees, and günlük trees which are peculiar to Muğla only and found no where else in the world, are the essence of green texture of Marmaris. 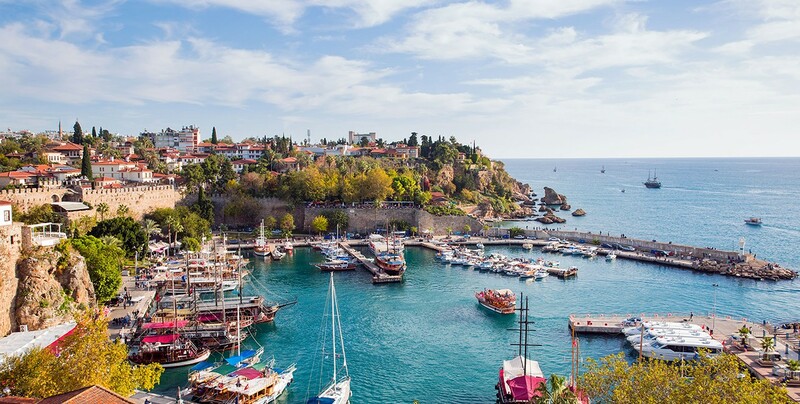 You have a choice of itineraries for your sailing holiday - east via Ekincik and the Dalyan Delta into the beautiful Fethiye Bay, a yachtsman’s paradise with many sheltered anchorages, coves and islands, or west via Bozburun, once the centre of sponge fishing in the Aegean, into the scenic Gulf of Datca. 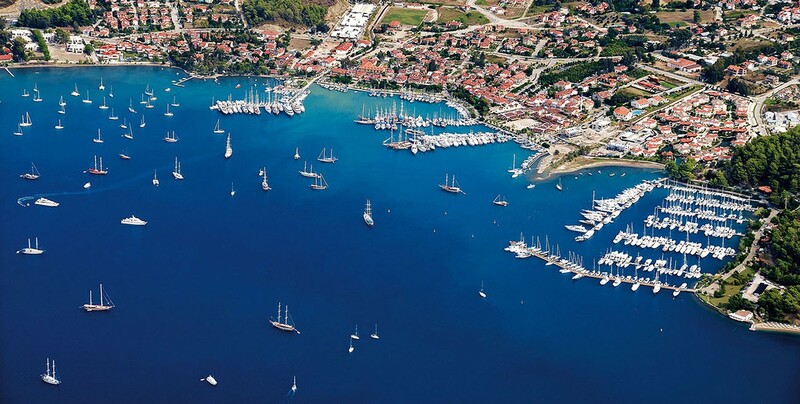 One of the most elegant yachting resorts of Turkey. A point to meet the most beautiful boats. Ultramarine blue sea, mountains and pinewoods sketch the landscape. Many choices of shops, cafes, restaurants are to be found along the narrow streets of the town. Dalaman Airport (DLM) is the closest airport to Marmaris at roughly 90 km away, and receives both domestic Turkish flights and international flights from across Europe. Frequent shuttle-bus departures handle the transfer between Dalaman and Marmaris. Excepting travelers who are exploring Anatolia's Aegean coastline by car, this air-and-bus combination the only practical way to reach Marmaris for most travelers. Charter flights to Dalaman Airports leave very frequently from major airports in the World between April/May and October/November and less so between mid November and April. Coming from Greek Islands ; There are ferries between operated by ferry companies has daily trips between Rhodes and Marmaris throughout the summer. The same association also runs a hydrofoil during the summer months everyday. Marmaris has a Mediterranean climate characterised by a hot and humid summer and cool, rainy winter. Showers and rain are very unlikely between May and October.Summers are hot and humid, and temperatures can reach over 40°C sometimes during heatwaves in July and August. October is still warm and bright, though with spells of rain, and many tourists prefer to visit in the early autumn, especially in September, because the temperatures are not as hot. Marmaris was once a sleepy Turkish fishing village with an excellent harbor, and in the off-season it still has that atmosphere. During the summer months, it becomes a major European beach resort and swells to a population of at least 200,000. It is an especially popular destination for European package tourism. 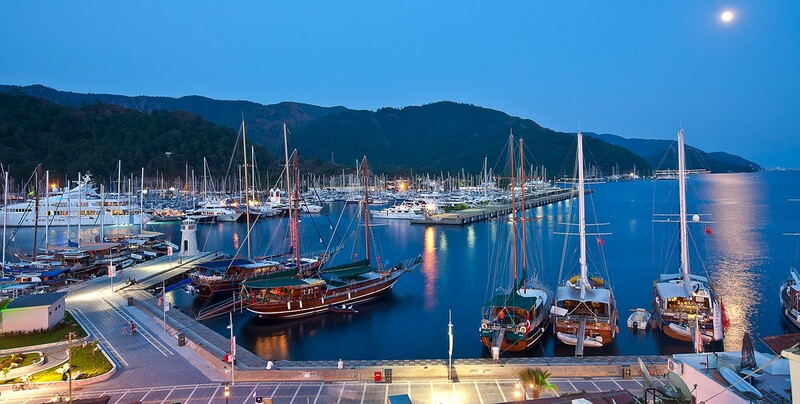 Located in the southwestern part of Anatolia, Marmaris is 559 miles south of Istanbul. The town of Marmaris is located at the meeting place of the Aegean and Mediterranean seas, on the world's largest natural harbour, surrounded by pine-clad hills. Situated in southwest Turkey, in the province of Mugla, Marmaris is one of Turkey's biggest tourist resorts. To the north lies the Gulf of Gokova, to the south the Mediterranean. On the west is Datca peninsula and to the east Koycegiz lake; all year round Marmaris is surrounded by blue and green. The hills running in to the sea and the beautiful bays make Marmaris very special. Set against a backdrop of pine clad hills, Marmaris is a resort that combines natural beauty with an astounding zest for life. Famed forits nightlife, the most extravagant on the entire South coast, this developedresort offers the best of both worlds; the nightlife is unending, andnumerous clubs and bars stretch along the coast from the elegant marinato the curve of Icmeler, the smaller resort close by. On the other hand, thesurrounding countryside offers the best in culture, due to the successionof scenic roads and sympathetic villages, which lead to ancient ruins andunspoilt beaches.Perfect for all age groups, Marmaris is one of the most popular resorts inTurkey. Once you visit it, you will understand why. A local rumour has it that the reason for the change of name Mimaras was that Suleyman, on returning from his expedition to Rhodes, disliked the castle and exclaimed "mimar as! ", which means "hang the architect!" Unfortunately there is no evidence to support this amusing story.